According to a new study by researchers from the National University of Singapore (NUS), plastic nanoparticles—minute pieces of plastic that measure less than 1 μm in size—could potentially pollute food chains, and eventually affect human health. They learned that nanoplastics are easily ingested by oceanic organisms, and they collect in the organisms over time, with a risk of being moved up the food chain, threatening food safety, and posing health hazards. Ocean plastic pollution is a massive and growing problem worldwide. It is projected that the oceans may already contain more than 150 million ton of plastic, and annually, around eight million tons of plastic will find its way into the ocean. Plastics are not easily degradable. In the aquatic environment, plastics are typically broken down into smaller pieces by the waves, sun, microbial. and wind action. These micro- and nanoplastic particles in the water may be consumed by filter-feeding marine organisms such as tube worms, barnacles, and sea-squirts. Taking the acorn barnacle Amphibalanus amphitrite as a model organism, the NUS team established for the first time that nanoplastics ingested during the larval stage are retained and collected inside the barnacle larvae until they touch adulthood. The researchers incubated the barnacle larvae in solutions of their regular feed joined with plastics that are around 200 nm in size having green fluorescent tags. The larvae were exposed to two varied treatments: ‘chronic’ and ‘acute’. In the ‘acute’ treatment, the barnacle larvae were kept for three hours in a solution that had 25 times more nanoplastics than latest estimates of what is present in the oceans. Oppositely, under the ‘chronic’ treatment, the barnacle larvae were exposed to a solution comprising low concentrations of nanoplastics for up to four days. The larvae were then strained from the solution and analyzed under the microscope. The movement and distribution of the nanoplastics were observed by analyzing the fluorescence from the particles present in the larvae over time. Despite the fact the barnacles’ innate waste removal pathways of molting and excretion brought about some removal of the nanoplastics, the team detected the persistent presence of nanoplastics inside the barnacles during the course of their growth until they touched adulthood. The team’s study findings were first published online in the journal ACS Sustainable Chemistry & Engineering in March 2018. The research was sponsored under the Marine Science Research and Development Program of the National Research Foundation Singapore. 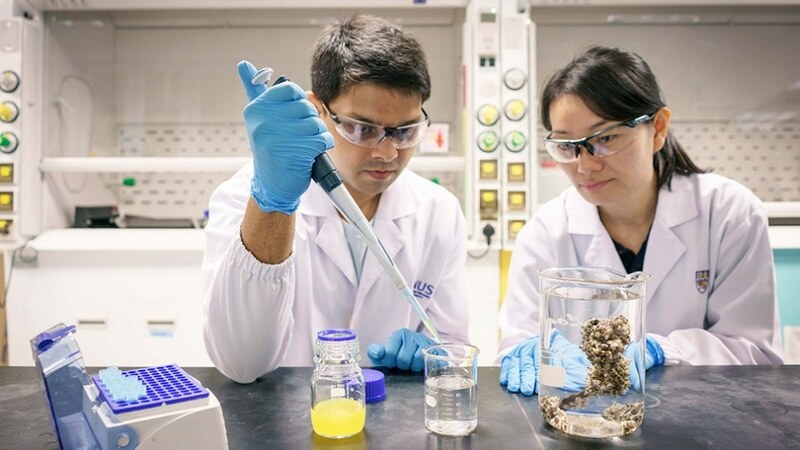 The NUS research team aim to expand their understanding of the translocation of nanoparticles within the marine organisms and possible pathways of transfer in the marine ecosystem. The team is presently analyzing how nanoplastics impact other invertebrate model organisms to comprehend the effect of plastics on marine ecosystems.